Quick reminder that Dublin OCC is tomorrow at 9am in Morrison Hotel. Great coffee, free Wifi and a visit by Paul Walsh of Segala. What more do you need? Not only that but Galway OCC will be held this Friday at DERI, Galway, at 11am in the IDA Business Park Dangan. I want to try and get all the OCCs listed in the sidebar along with any other meetups/tech events on the island. Please add your events to Upcoming, let us know about them and we’ll join as attending/watching and they’ll appear here. Any chance we’ll see Enterprise Ireland attendees at either? I note that Cork OCC has a regular County Enterprise Board attendee. I think those guys are realising that web start-ups are in the sweet spot of their mandate. One of the most successful community sites in Ireland, EuropeanIrish, has just had a major re-launch. This site has been quietly growing to an impressive 1 million uniques last year from its beginning in 2003. For most of its existence it was a part-time labour of love for Siasy Collins but with the closure of Motorola in Cork, he finally took the opportunity to give it his full attention. The site is all about Irish ex-pats on Continental Europe having somewhere to congregate virtually so they can socialise better face to face. In some ways you could think of it as a niche Upcoming.org since it always has a big list of events that are happening around Europe. But there is a lot more to it than that and it has had a thriving community for many years. 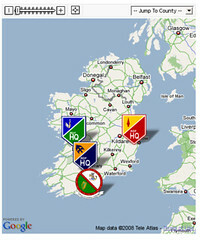 In addition to a general re-build and facelift, they have added “MINE” – My Irish Network in Europe. This is effectively a Social Network for ex-pats and is an idea I love. There are only so many generic Social Networks that are going to get traction but a niche one like this, where you know that the other members have much in common with you, should see lasting growth. Siasy says that 300,000 Irish people have now made their homes across Europe, and there were 3.5 million trips by Irish residents to the Continent in 2006. It looks like many of those Irish have been using the site for years. Whether it’s entertainment, pubs, social clubs, discussion forums, cultural issues or general news, the site has an angle on it. EuropeanIrish is based in the Rubicon Centre in CIT in Cork and is taking part in the Genesis Enterprise Programme. The buzz on the Twitter lines is all about stealth Irish start-up MOLI raising $30m in private investment. According to the Silicon Republic article, they have 55 employees and are based in the Digital Hub. They are supposedly concerned with managing multiple SocNet profiles from one account. This sounds like it could be very useful, particularly if it dovetails in with all the current efforts around data portability. Further descriptions muddy the waters slightly with mentions of “professionally-produced content coupled with interactive e-commerce features enabling members to connect and conduct business with other discerning individuals, groups and businesses”. There are hints of LinkedIn, Facebook, PodTech, Yahoo, eBay and Amazon in that one sentence. You can sign-up for free on the site now and I’m off to have a good poke around. The design and production levels seems very high indeed. It also looks like they are the only company based here that has a slot at DEMO 08. It’s fantastic to see high net worth individuals investing serious sums of money in the Web2 space in Ireland. We’re keeping a close eye on Ammado in that context too. Surely this is just the tip of the iceberg for those looking to add a bit of excitement to their investment portfolios? UPDATE 1: Further scratching seems to reveal that they allow multiple profiles within their site, not across SocNets. Therefore are they positioning themselves as YASN with a demographic focus on late 20′s/early 30′s? i.e. somewhere between Facebook and LinkedIn. I wonder if you or your readers can give me some advice on the best banks for ecommerce start-ups. The reason I ask is that I work for a training business and we added a course booking function to our site last year. When we applied for a merchant account with BOI’s merchant account arm called Evalon we had to jump through hoops. that a student could theoretically request a ‘charge back’ on their credit card if they had a problem with their course. We argued that this just wouldn’t happen and that if there was a problem we would sort it out by other means. Eventually they approved our application, after threatening letters to and intervention by our bank manager and a huge cash security. I wonder if your readers have experience with these types of issues, and whether they know of a bank (with a merchant arm) that is more welcoming to these types of transactions? This isn’t something I know anything about and I think we could all gain a great deal if we heard other stories/advice in this area. ENN reports that pharmaceuticals businessman Gerry Brandon is raising a seven-figure investment sum for his new online collaboration network Eplixo. Some great points from Jobster founder Jason Goldberg today around making your start up work. * The CEO’s job is to create value. * Try to ride some powerful existing waves vs. just creating new waves. * Technology companies are all about the product. * You must get close to your users and customers and live their personas. If you haven’t yet heard or seen anything about CreativeCamp then check out http://creativecamp.barcamp.ie. CreativeCamp will be held in the Parade Tower at Kilkenny Castle on Saturday March 8th. Registration forms (for attendees and speakers) are now live on the CreativeCamp site and the blog will be updated over the coming weeks with more details on talks and happenings in and around CreativeCamp. Just got a mail from the military.ie guys about their first Google Maps mashup. It’s very simple but it’s bloody impressive to see them try this stuff out. It displays reserve defence force unit locations and organisation around the country. They call it a work in progress but I completely agree when they say it is a big first step for a public service to embrace this technology at all. Of course something simple like this gets the synapses firing and you start thinking about real-time GPS tracking of units and activities on Goog Maps. Those old public service announcements about artillery practice in the Glen of Imaal could be brought right up to date! One quick tip – it would be great if they’d add an RSS feed(s) for news on the site (and maybe Feedburner email subscriptions) so we’d here about any new things they are doing. On a side note, I love the new ads on the radio and the URL really sticks in the head. Well done to whoever is running PR and Marketing in the Defence Forces. Now folks – tell us what you’re planning to do with Facebook – check poll here.. This four day event kicks off on Feb 27th in Dublin. The outline agenda looks good and they have been adding great speakers at a fast rate. Day 2 may be of particular interest to start-ups. They have 15+ slots of 15 minutes each for web start-ups to demo their product to the assembled crowds. There are still some slots open so mail conference AT irishdev DOT com if you want to be considered for one of them.